One of the main activities of my QES-Advanced Scholarship at Wilfrid Laurier University, the Balsillie School of International Affairs and the Centre for Governance Innovation in Waterloo was to analyze data I collected during 2016/2017 on urban food security and supermarket expansion in Windhoek and the secondary Namibian cities of Oshakati, Ongwediva and Ondangwa. The opportunity to put pen to paper and analyze data, was exciting. To do this from Canada while working among distinguished food security scholars, was even more welcome. However, even before I could recover from jet lag, we were at a series of meetings in Ottawa, to gain insights into the programs of the Government of Canada and certain international institutions. Together with other QES-Advanced Scholars and BSIA students, we visited Global Affairs Canada, Treasury Board of Canada, The Privy Council, IDRC, Embassy of the Kingdom of the Netherlands, UNHCR and the Aga Khan Foundation. The QES-Advanced Scholars also visited the “Diefenbunker” museum, a symbol of Canada’s response to the Cold War, as well as the Parliament Buildings with their spectacular view of the Ottawa River. Back at the Balsillie School in the Feminist Professor’s office, which I was allocated during my 3 months’ stay, reading through the survey data transported me back to the many interviews I conducted in Namibia: seeing and hearing about poverty and food insecurity; how women skip meals to make allowances for children; how women had to buy offal; how supermarkets were not offering credit; the socio-economic and political realities, constraints and inequities; the lack of food governance and so on. The levels of food insecurity in the informal settlement of Windhoek increased between 2008 and 2016. For such a small country, there is a rapid expansion of supermarkets through the development of shopping malls, but does this make food more accessible to the urban poor? 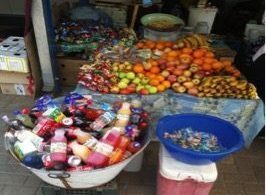 Most residents in Windhoek shop at the supermarkets only on a monthly basis, whereas frequent food shopping, for example on a daily and weekly basis, is sourced from informal food markets, which includes street food vendors. In Oshakati, Ongwediva and Ondangwa, in the north of Namibia, the rate of urbanization is increasing, food insecurity levels are rising as the cities’ priorities are infrastructure development, such as roads and land acquisition from nearby villages for housing developments, and service provision. While in Canada, the realities of food insecurity in Windhoek confronted me in surprising ways. During a visit to and in conversation with the Toronto Food Strategy team, I realized how vulnerable Namibia is to food insecurity in the event of major shocks such as floods. For example, Namibia relies on a single road infrastructure to import 95% of its food from South Africa. There is, therefore, an urgent need for critical engagement with policy makers at local and national level to tackle the food insecurity challenge.